DON’T FORGET TO VISIT OUR MAP INDEX !! Here we have a multi-purpose underground dungeon temple. It can be easily adapted to many different scenarios, depending on the campaign setting. It could be a: cultist underground temple, an abandoned temple, a temple dedicated to an occult forgotten god, the hiding place of some thieves guild members…. The first chamber with the pillars can include bas-reliefs on the walls, depicting the appropriate mythology. The uppermost chamber I left empty, but can serve as a confession place or a chapel. Going down the stairs, there are two chests. They can be trapped, or intended for people to leave weapons behind, before entering the temple proper. Next there some alcoves with alters to different saints, angels or fiends (depending). There is a well surrounded by four gold plated statues. If appropriate, the statues can be activated with a pressure plate to attack any intruders. Or the well might contain poisoned water. Two twin stairways ascend to the libraries, where dusty old tomes await rotting. Right after entering the main chamber, there is a pitfall trap. The temple’s cultist know well where the pressure plate is. A visitor falling into the trap might well lose his or her life, The bottom of the shaft is covered with spikes. In the temple proper, there is an effigy of the temple’s god. And at its feet, there another well. It’s the well of fate. Anyone faithful enough and willing to make a sacrifice, can get the well’s blessing. Depending on the god’s alignment, the sacrifice can range from accepting a quest, dropping your own blood in the well or a living sacrifice. 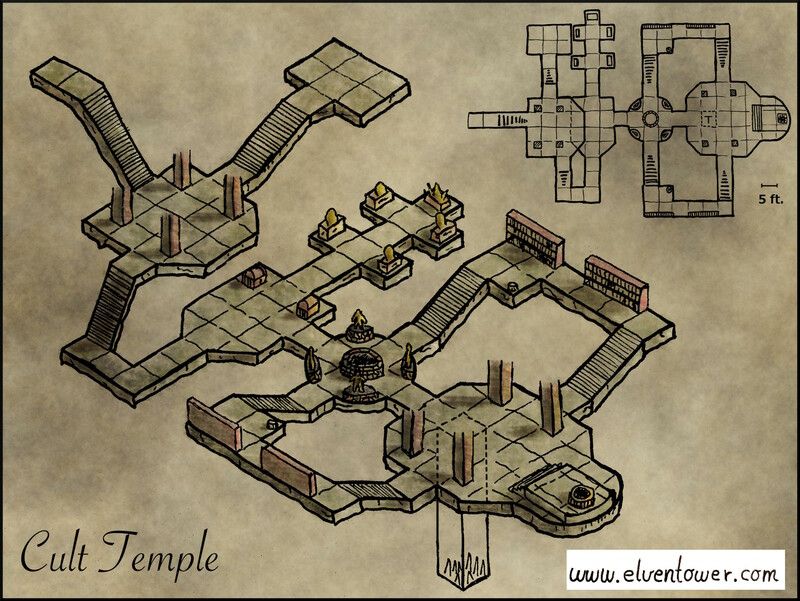 You can find this map in High Resolution PDF in my patreon account. My mapping ventures are funded through Patreon, It is thanks to people who like my work that I am able to continue mapping and providing RPG original experiences to people all over the world. If you like what I do, consider getting involved and backing me. What you get is impressive hi-def versions of my maps to be used in your RPG games (these have lower resolution), and the satisfaction of helping the rpg community grow bigger and stronger. Help me get funding and enjoy hi resolution PDF version of my work. If this option is not the best for you, you can also directly make a donation through PayPal. It helps me fund this project and I will be just as grateful. Thanks a lot !! Did you like this map? There are more where this came from, visit our Map Vault. Consider liking our Facebook page. All the maps in this website are registered under the Creative Commons License Attribution-NonCommercial CC BY-NC. What this means is that anyone can use them, share them or modify them. They cannot be used commercially. And finally, credit must be given to me (Derek Ruiz) as the author, and a link to this web page must be included if it is shared or redistributed. Thanks for the inspiration! I just want to give a Little feedback on what i did for my Dnd 5e. I’ve planned to make this into a cuthulu temple with ratmen (giant rats reskinned to small humanoids). In the alcoves are statues of Cuthulu (reskinned animated armors) and 2 are already destroyed. The well in the middle have an gibbering mouther so that whole room is unstable. then i added an extra room for the ratman priest to live in, the rest lives in the first room. Thanks for the great output to the Community of RPGs! Hello Henry this is one of my earliest maps. Back then I drew on paper with micron pens, then scanned and edited in photoshop. Nowadays o draw “by hand” with a Wacom tablet directly in photoshop. I have what I’m sure is a silly question – what goes in the gaps between floors? Is this meant to be a big open space or are the areas without floors (ie between the book shelves and the lowest floor) meant to be walls? If someone is standing at a book shelf, can they see the space with the pit trap? If so, is there a pit between them? I meant for the empty spaces to be unreachable. Each walkway or room is supossed to have walls and ceiling. It’s an enclosed space. But any GM could say otherwise, maybe it’s a floating demi plane in the middle of nowhere.